My name is Lauren Seawell and I am a senior at Northridge High School! I am the daughter of Jay and Stephanie Seawell. I am the youngest of three with one older sister Brooke and an older brother Jackson. We have lived in Tuscaloosa for 17 years and have been apart of Trinity the entire time. Can you share one way that God has been faithful to you recently or something he is teaching you? Throughout your senior year, there are definitely moments that get overwhelming or that are so busy you feel like you can’t keep up. But through this year, I have noticed how important it is to have a relationship with the Lord and spend time with the Lord. This year I have had to make a lot of big decisions like where I will go to college, what I will major in, who will I live with. And through all that the Lord has been with me, helping me make the right choices. In Isaiah 41:10 it says “So do not fear, for I am with you; do not be dismayed, for I am your God. I will strengthen you and help you.” This verse has been my go-to verse during times of worry and stress. I enjoy playing basketball and softball for my school. When I have free time outside of sports, I love to go to Young Life and hangout with my friends. I also enjoy painting whenever I get the chance. Where will you attend college? Do you know what you'd like to major in? I will be attending the University of Alabama in the fall studying in Public Relations. Do you have a special or particular memory from your years at Trinity? Growing up in Trinity, there are so many fun memory’s that come to mind. From being at ACA to going to VBS; from learning songs with Mrs Robin Lake in Sunday school to now going to summer camp with the youth group. Trinity has been an amazing place for me and my family. Is there any way that we as a church could pray for you? Finishing up senior year and going off to start a new chapter in just a few months can be scary but exciting all at the same time. If y’all could just pray for the change to be easy and for me not to be anxious and worried, I would so appreciate it. Write all my papers with paper and pencil before ever typing them onto the computer. Anything having to do with Frozen or Pigs! Name three things you are loving. I am loving country music, Panera, and double chocolate chunk ice cream! What are you reading or have you recently read? The Selection by Kiera Cass—- it is so good! 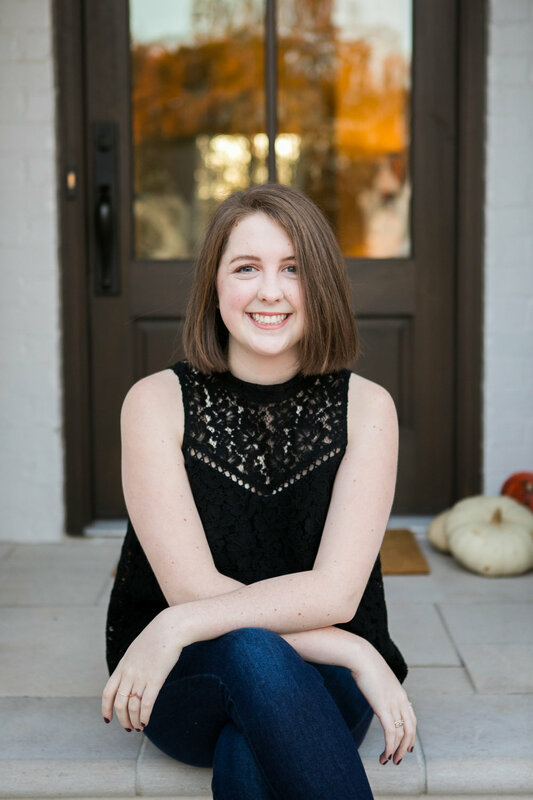 My name is Catherine Moore, and I am a senior at American Christian Academy. I am the youngest of my family. I have two older brothers, and my parents have been bringing our family to Trinity for almost 24 years. Recently, God has been faithful in the way of providing close friendships with mentors as well as people my own age. These relationships have strengthened my faith and given me a sense of peace as I am about to leave for college. My main hobbies are art, literature, music, and French. I hope to study all of these in college but make a career out of my love for art as a graphic designer. I will be going to Auburn University in the fall. I plan on majoring in graphic design and minoring in French. I have been at Trinity all my life, so there are a myriad of memories I could talk about. One of the things that has stuck out the most though is the way women have invested in me and loved me since I was a kid, so any memory involving those women is very special to me. I would appreciate prayer for my transition into a different phase of my life. College is very exciting but also very daunting, so please pray that the Lord would continue to give me peace and confidence as I head into a new chapter. I have to say I love these plaid pants that I got for J. Crew. I have memorized too many songs to count. Music is such an influence in my life, so memorizing lyrics just comes naturally. I have memorized everything from the Hamilton, Les Miserables, and La La Land musicals to Lake Street, John Mayer, and Mumford and Sons. Lake Street Dive has been a favorite of mine for years now, and I can still listen to them for hours on end so I can always count on them when I need some good tunes. I like to write the old-fashioned way, with a typewriter. I also like to use a record player, so you could say I think that in some cases the old way is the best. As far as genres go, I can never get over action movies and classic literature. The book that has impacted me the most is Pride and Prejudice, simply because it instilled in me a love for literature. The best thing about getting older is obtaining more experiences and more wisdom. The worst thing is having to move on from people who you wish you could have in your life forever. I am loving new friendships, coffee, and that feeling I get when an art piece comes together. Right now, I am reading a memoir called The Only Girl in the World by Maude Julien, but there is always a Jane Austen novel I am working on too.